Harry wins 51% of the Coffee Shop in a bet, only to find it's mortgaged to the hilt. Charles and Barbara plot to kill Terry. Terry finds the tape is missing. Barbara and Lucy chat in the park. Barbara offers Lucy a lift home. Lucy gets out of Barbara's car to go into a shop. 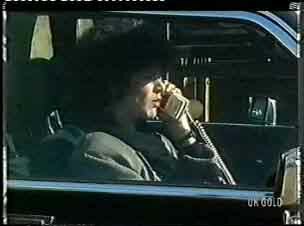 Barbara calls Charles on her car phone and he tells her to keep Lucy away from Ramsay Street for a few hours, to scare Terry. Sarah bumps into Helen in the main street - Helen is shopping for a wedding dress. Helen invites Sarah for a wedding dress, but she is rather on edge and says she has a bus to catch. Barbara tells Lucy that she's rung her house to tell them they're out looking for the dog, so she won't get in trouble for being late home. The car phone rings and Barbara answers it. She tells Lucy that Rufus has been spotted down by some old factories. Daphne and Terry are very worried about Lucy's safety. Daphne wants to call the police but Terry doesn't want her to. She says she has an idea. Harry is dancing to music on the radio when Helen comes in. She is the only customer. 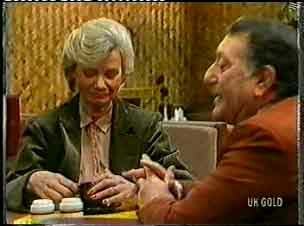 He tells her about his great plans to turn it into a continental-style cafe - as soon as he can get rid of Eileen(!) 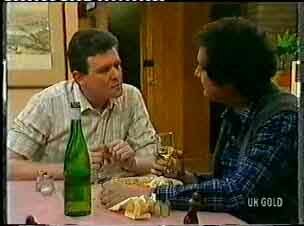 Helen suggests that Harry talks to Eileen about it, but he reckons he can't get a word in edgeways! Helen reluctantly tells Harry that his coffee is terrible so he makes her another one! Terry calls Charles. She tells him she has some news - she's found the tape and she's made copies of it. Each copy is with a different person, so nothing can happen to her without the tape getting to the police. Charles is not pleased. She tells him that he has one hour to get Lucy home or the tape will be released to the police. Barbara and Lucy are "looking for the dog". While Lucy looks, Barbara calls Charles on the car phone again. Charles tells Barbara on the phone about Terry's phone call. He reckons Terry is bluffing though. BARBARA: Stop panicking. I know exactly what to do with Lucy. Daphne angrily tells Terry that they *must* call the police. Terry says that Lucy will be home soon, but Daphne calls the police anyway, saying she'd like to report a kidnapping. Daphne and the police arrive looking for Lucy. Charles invites them in for a look around, but Lucy isn't there. He says that he can't help them - he's been at home this afternoon listening to some tapes. He tells the police that Daphne is getting his own back on him. He says he dumped her because she's a stripper. Harry is making multiple cups of coffee for Helen to taste! She's politely trying them all, but none are any good. Finally she gingerly tastes the last one and this one is actually good! Harry is delighted. He asks Helen if he can sing at her wedding and gives her a demonstration. Helen tries not to laugh and says she'll think about it. Daphne is angrily defending herself to the police. Charles is being holier-than-thou and being very polite to the police. When Daphne and the police have left, Charles calls Barbara, but she's not in the car. Helen is tasting some of Harry's cakes now. HELEN: You do realise that if I become your official taster, you'll have to pay me danger money? She says the cake is nice and Harry offers to make her wedding cake(!) and gets thoroughly carried away. Finally Helen tells him that it's not going to happen - she just wants a quiet registry office affair. Sarah comes in and sits with Helen - she decided to stay in town after all. Lucy is still not home. 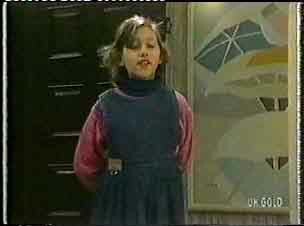 Daphne is about to tell Terry about calling the police, but just then Lucy comes in, safe and sound. 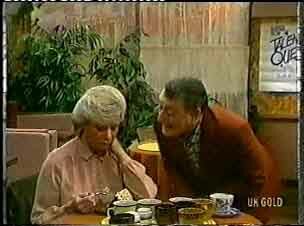 Charles is telling Barbara about the police visit. Luckily they didn't suspect him at all and are more suspicious of Daphne. Barbara is still concerned about the tape. Terry and Daphne are interrogating Lucy about where she's been. Daphne wants Lucy to promise not to go near Barbara again - she's not a nice lady. Helen comes in and is concerned to hear that Lucy has been off with a woman. Lucy starts to cry and flings herself into Helen's arms. Des has popped round to see Max about Eileen. He explains that Eileen tries to get into other people's lives because she doesn't have one of her own. He thinks they should try to help Eileen's romance with George along. DES: Mum needs a man in her life. Des says that Eileen isn't a bad person and she and George are well-matched. Terry is ranting at Daphne for calling the police. Daphne reckons that Terry shouldn't risk Lucy's life over her own. But Terry reckons the police suspect Daphne more now so Charles has free rein to do what he likes. DAPHNE: You didn't even want me to warn Lucy about Barbara. Well, you're on your own, I've had enough! She storms out, slamming the door behind her.